World Telecommunication Day has been praised every year on 17 May since 1969, marking the founding of ITU and the signing of the primary International Telegraph Convention in 1865. It was instituted by the Plenipotentiary Conference in Malaga-Torremolinos in 1973. 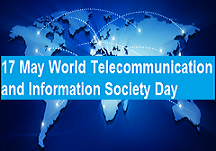 In November 2005, the World Summit on the Information Society called upon the UN General Assembly to announce 17 May as World Information Society Day to center around the significance of ICT and the extensive variety of issues identified with the Information Society raised by WSIS. The General Assembly received a determination (A/RES/60/252) in March 2006 stipulating that World Information Society Day might be praised each year on 17 May. On the event of ITU's 150th Anniversary, ITU150 Awards were propelled to perceive individuals over a significant time span from government, ICT industry, the scholarly community, and common society that have added to improving existences of world residents through ICT innovations created, advanced or executed by ITU. In recent years there has been huge advance in AI innovation, made conceivable by colossal advances in contributing fields, for example, Big Data, machine learning, computing power, stockpiling limit and distributed computing, among others. AI-based innovations are as of now emerging as a key part of proactive apparatuses and applications being utilized to enable individuals to have better existences by improving social insurance, instruction, finance, agribusiness, transportation, and an extensive variety of different administrations.